THE character of the genus, Pachysandra, only is given in the above botanical description, as there is only the one species, P. procumbens, known in the United States. Indeed, there is but one other species known anywhere, and that is, singularly enough to one who has not studied geographical botany, a native of Japan. It is, however, not uncommon to find isolated species in the Atlantic States of this continent, with corresponding allies in Japan. These are usually of genera represented by a limited number of species, and the phenomenon suggests that there may have been geological disturbances wiping out what probably were the great centres of vegetable families, and leaving only the few scattered outposts on the boundaries. The nearest link now left in the chain of relationship is the common Box of our gardens, although the superficial observer will fail to see much in common between the two. Any one, however, who will compare the flowers of the Box with those of P. procumbens must see how nearly the structures correspond. In the Box the spike is very closely drawn together, so as to form a dense head. The lower flowers are all male, with four stamens in each flower, and the female flower, with its three stigmas, terminates the head-like spike. In Pachysandra the spike is long drawn out, the male flowers occupying the upper portion, while the female flowers (generally two), with their three stigmas, are at the base. In our plant the stamens have remarkably thick filaments, and this suggested its botanical name, Pachysandra, which is the Greek for "thick stamen." The plant seems to have no common name. It may, perhaps, be admissible, therefore, to adopt the translation, and in contradistinction to the Japan species, to call this the " American Thick-Stamen." Our plant is recorded by botanical authorities as inhabiting woods in mountain districts from Virginia and Kentucky southward to Western Florida; but we seldom find it referred to by local authorities, and it is rarely met with in collections of dried plants made in the South. It is, perhaps, confined to districts out of the usual line of travel. For a plant with a chiefly southern range, it is a very hardy one, for it has been found to endure the winters unprotected in the gardens of most of our Northeastern States. Though, according to the descriptions of authors, it grows naturally in woods, where it may have shade in summer and the protection of leaves in winter, it nevertheless thrives very well in open garden borders without any covering in the winter season. It is very much prized by the lover of curious flowers, not only for the peculiarity of its structure and the earliness with which it blossoms, but for its delicate fragrance. The frost is scarcely gone before it is in blossom, but so inconspicuous is the whole plant that but for the sweetness of its flowers, which attracts insects to it in immense numbers, it might easily be overlooked. Bees from long distances find out the flowers and do homage to their sweets. Indeed, we know of no flower to which the idea of modest worth is more truly appropriate. Many a "wee little thing" possesses "blushing" beauty which has to be sought for among the grass. This does not blush, - it has no color, - but it is retiring, and yet has intrinsic worth. When American poetry shall have appreciated all the pretty expressions of American flowers, we shall have as much of interest associated with this as with the violets of the Old World. In the mean time we can appropriate for it White's beautiful lines: "No ostentatious wish to seek for praise, But still retiring from the public gaze, It spreads its sweet beneficence around, And by the fame it shuns can but be found." The flowers are arranged to insure self-fertilization, and this is aided by the visits of insects. As shown in the plate, the male flowers are in the upper portion of the spike, the two lowest being the female ones. The anthers burst a few days after the stigmas are in a receptive condition and the pollen can easily fall on them. The insects in their visits only enter the male flowers, and though they get covered with pollen, never come in contact with the pistils; but the stamens have an articulation by which they are readily detached, and after they have been visited by the insects, they fall and carry the pollen to the stigmas below. The blossoming is generally over by the first of May. 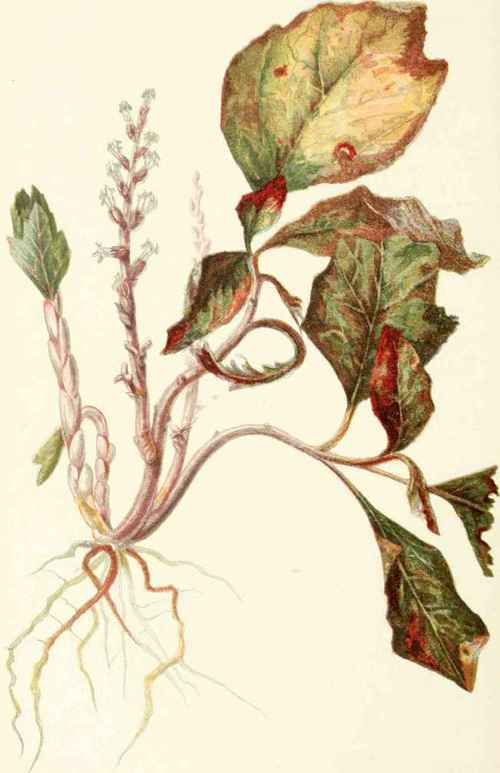 The way in which the plant grows on from year to year offers a very pleasant subject for study, and our artist has caught a pretty phase in the plant's life. It is, to a certain extent, a shrub; at least, it makes a shoot one year from which the flower is to come the next. The leaves remain on the little branch till spring, and until after the flower has matured. They commence to turn color as the young flowers form; at the same time, the plant pushes out its new growth for the next year's work. Thus we have the old leaves with their varied colors, the maturing flowers, and the young growth in regular order. The same succession goes on from year to year, all the older growth dying, and in this manner the plant advances, so that in the course of many years it travels a long distance from the original spot, although at the rate of but an inch or so in a twelvemonth. It makes two buds a year, however, and by that means an immense increase occurs in the course of time. The scales on the young stem-growth make a pretty feature. It is seldom that we see so many in so short a space. The student, of course, knows that they are but leaves modified. The plant needs no leaves underground, but Nature, in her abundant provision, prepares innumerable elementary parts beyond what ever come to perfection, so that she is always ready to act when the time comes. Sometimes these unformed leaves perform the office of bud-scales, and may protect the flower, but the number is so great that they can never be all needed. The transition from the scale or imperfect condition to the perfect leaf, as we see by the plate, is not gradual, but by one great leap, and this, also, is very common in morphology. The change from one form of structure to another, though each be composed of essentially the same elements, is seldom by gradual approaches. The seeds of the American Thick-Stamen do not mature till autumn. The plant is, however, never raised from seed in gardens, but is propagated by dividing the root-stocks. It is not found nearly as often in gardens as from its many points of interest it deserves to be. prev: Golden Columbine. Aquilegia Chrysantha, Asa Gray. Natural Order, Ranunculaceae. next: Stud-Flower. Helonias Bullata, Linnaeus. Natural Order, Melanthaceae.